This rare and interesting photograph has only recently come to light. It is an image that nobody knew existed and has not appeared in any of the books that have so far been written about Quorn. It is a view of the right-hand side of Loughborough Road, looking from the centre of Quorn towards Loughborough. The large house, centre-left, is Rose Cottage, a Victorian property which was occupied for over 30 years by George White and his family. George was a well known local figure. He was a solicitor’s clerk at Woolley, Beardsley and Bosworth Solicitors in Loughborough for over 50 years. He held several positions in Quorn, including Clerk to Quorndon Urban District Council and he was also a house agent and property developer. George and his wife Mary Ann lost two of their sons in WW1. Rose Cottage was demolished in the 1960s and replaced by a petrol station. When the garage closed in the late 1990s the site was unoccupied for several years, until in 2007 it was redeveloped and three new houses were built. 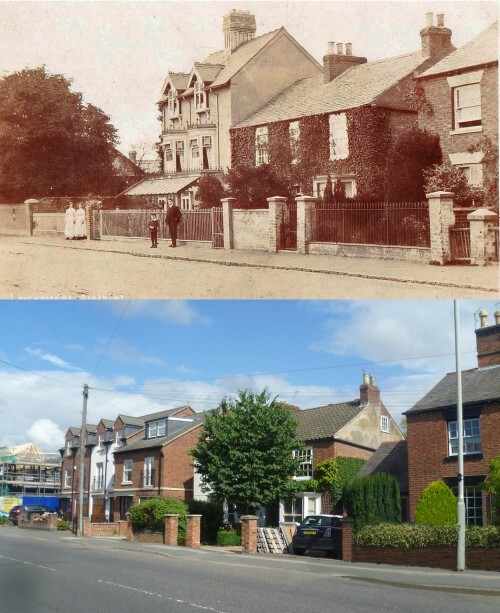 The three cottages to the right of Rose Cottage still exist today, and are numbers 15 to 19 Loughborough Road. Number 15, on the far right, is Beaconsfield Cottage.